12.25.12 Baby Jesus, Christmas, memories, cooking, and more selling! Christmas Eve service at church tonight was exactly what it should be. A beautiful reverent reminder that Christmas is about the birth of Jesus Christ. He came from Heaven to earth as a tiny infant – a human. How amazing is that! God chose to come to earth in the form of his son Jesus as a human. Bro. Randy spoke on Sunday and tonight about looking past the cradle to the cross. That is what the total message is about. Jesus came as an infant, grew up in the same world we live in, remained sinless and gave his life on the cross to take on our sins and save those who choose to follow him for all eternity. I’m very simple in my beliefs and while it could be described much better by others what I described is the basic truth. Southern Baptist aren’t very much into rituals but the Advent Wreath is one tradition I look forward to each year since it represents the story of Jesus’ birth. A candle in the Advent Wreath is lit every week leading up to Christmas. Each candle represents a part of the story so the children hear it a little at a time and learn from it. The final candle, the Jesus candle, was lit tonight with all the children surround our pastor as he spoke to them. These children will learn over time how blessed they are to have parents who love them enough to introduce them to Jesus Christ and bring them to church to increase their knowledge of him. Some of those children’s parents grew up in our church and I’m so happy to see that their children are now learning about the love of Jesus through their teachings and those of the church. Our children were brought up learning about God’s love and it was wonderful to see our granddaughter in the gathering of children around the advent wreath on Sunday morning when the second to last candle was lit in the group around the Advent Wreath. I pray that all parents will make their children’s faith the highest priority of teaching they can give them. Today on Christmas Eve, 2012 the last of our house furniture was sold. The dining room table and chairs were sold yesterday and the matching buffet server went today. The table and chairs were the hardest pieces of furniture to let go of. We purchased it around 30 years ago when we lived in Metairie, Louisiana. Many, many memories were created around that table from dinner parties with friends, family dinners, regular family meals, children’s homework, dozens of puzzles and whatever else we used it for. It was a beautiful solid oak dining table and matching oak chairs with cloth covered padded seats. After our sons wore out the original seat covers they were replaced and held up well. I hope their new owners will take good care of it and have many years of enjoyment as we did. Selling our house furniture hasn’t been too bad until this. The house is looking even emptier now. We’ve still got a lot of computer stuff upstairs but that’s going to be addressed really soon – even if it kills us (meaning Roy!) Today Roy, Chip and I spent a lot of time cleaning up some tools and electronics to list on Ebay. Roy’s stilts used for installing sheet rock on ceilings were bid on minutes after posting it. I love it when people buy the odd things you’re afraid no one will want! There is truly a buyer for everything. I spent time in the garage putting garage sale stickers on five boxes of household things. The garage is starting to look better and more manageable. I posted pictures and descriptions of several things on our local Facebook buy, sell trade page. I doubt too much will be sold since tomorrow is Christmas but we can always repost after Christmas. Hope people didn’t spend all their money on Christmas! We bought our RV for our 40th anniversary, Christmas, birthdays Easter, and every holiday from now until forever! We won’t have any presents to open tomorrow (Christmas morning) since we did that on Sunday morning before church when our granddaughter Madisyn was here. No furniture in the living room except for the small tree and a few presents but that was all we needed. Our oldest son and his family won’t be with us this year so Paw Paw, Grannie, Chip and Madisyn had a lot of fun on our own. After church we watched our Saints win another heartache giving game! Geaux Saints!!!!!!!!!!!!!!!!!!! Louisianians say “Geaux” instead of “Go” so when you see Geaux you know it’s one of us! Once we said goodbye to Madisyn we all crashed and started recovering from several days with our active 3 year old granddaughter! Now that she’s gone and we’ve experienced having her with us in the RV we know better what we’ll need to take with us for when she comes to visit. I can envision a new Princess/Dora container designated for her in the RV basement. Cooking for Christmas so far has been interesting. The sticks house kitchen is pretty bare but does still have cooking appliances. After making a couple of trips to the RV to get things Chip and I needed we decided to make due with whatever was in the house. We had a spoon, a fork and one 16 oz. plastic cup. We used one of the cups to mix ingredients in, melted butter in the wrapping and several other makeshift things so that we didn’t have to keep running back to the RV for the real tools! I’ve sold the turkey cooking pan with lid so we’ll be cooking the turkey tomorrow in a short gumbo pot. I’m sure it will taste fine but this is quite an unusual cooking experience. There is no refrigerator left in the house so some stuff is in the RV and some in the sticks house waiting for morning to finish up the cooking. I’m becoming more convinced that once we sell the house, retire and take to the road that the experience we’re hoping for will come to fruition. Right now, living in our sticks house driveway with most of our life in the RV and a little still in the house is complicated. Having to keep work clothes available when what we’d really like is all play clothes is a challenge in itself. I do still have my washer and dryer since it hasn’t been picked up so I’m taking advantage of that whenever I can. I definitely like having the RV washer/dryer and it works fine for during the week but on weekends when there’s a lot of extras I still go in the house. I can tell that the RV washer/dryer will be sufficient for when we’re on the road and am happy we have it, as opposed to going to a laundromat on the road. When our son Chip comes home to visit he stays in the sticks house so there’s a lot of going back and forth. So many things are just unusual when living in your driveway! Chip and I were talking today about going through the various seasons in our lives. I guess we’re in the limbo season right now! Please someone buy our sticks house!!!!! December 2012 – the whole Disney trip – our first RV on the road experience! Roy and I decided in November to make our first RV trip a trip to Disneyworld around Christmas. The last time we went to Disney was three years ago at Christmas and it was so beautiful at Christmas that we thought it would be great to make our first official RV trip to see Mickey!! We checked with Madisyn’s mommy Liz and she said she could go with us so we made the reservations at Ft. Wilderness Campgrounds at Disneyworld. Several very helpful friends gave us good tips and information about staying there since we’ve never been to Ft. Wilderness before. There was a lot to do before leaving our sticks house and hitting the road. What was really nice was that we didn’t have to pack – what a difference that made. We didn’t forget one thing, because everything was with us! We loaded up lots of special snacks and food for Madisyn, and us!! We left Sunday after church and headed to Milton, Florida to pick up Madisyn. We meet her mommy in the Walmart parking lot near their home. Madisyn jumped out of her car and ran to see us and Dora. She got use to the RV on her last visit wiht us so she was very comfortable being in it. After playing for a while we all went to sleep. As weird as I thought it would be sleeping in a Walmart parking lot, it was no different than sleeping at home since we were in our own bed! Knowing that the lights we saw through the curtain were Walmart lights was a big odd though but we slept well! In the morning Madisyn woke us up with her puppy singing Christmas music. We all showered in the Walmart parking lot, ate breakfast and headed off to Disney. We strapped Madisyn in her car seat in the passenger seat (we called it her throne). Her eyes were big and amazed at the big windows and sitting up so high! A 7 hour trip from Milton to Ft. Wilderness turned into a 9 hour trip with multiple stops for various things including stretching our legs. Lesson one learned is that trying to walk through the RV on a road that is not extremely smooth is like trying to walk on a cruise ship during a storm. A seriously queasy stomach is sure to follow. Also, learned that I don’t travel in the RV too well when trying to walk around, getting up and down, fixing lunches, getting drinks for the Princess and her Paw Paw. During the two hours that Madisyn napped in our bed I sat in my passenger seat in the front and felt fine. Since that’s where I’ll be sitting when we’re really traveling I should be fine. Princess Madisyn needed her throne to be safe, so Grannie just stayed queasy until we got there. I’ve decided that’s one of the best purposes of the windows behind the sofas is so they can be cracked open for a queasy passenger, it sure helped! We thoroughly enjoyed looking out all the windows and seeing everything from a bigger, higher perspective. The weather was beautiful except for about an hour of rain. When we got to Disney we checked in through Dora’s driver’s window – very cool and convenient! The campground is huge and it took us quite a while to find our spot. We saw lots of Christmas decorations throughout the park, at least half the RVers brought Christmas blow up and light up decorations that they set up outside and on their RVs and the campground did a lot of decorations also. We found our spot which required a lot of driving through narrow curing pathways in the dark. Roy only tried to take out one car that wasn’t parked properly but otherwise handled it all masterfaully. We stayed at 1444 in Big Bear Run in Fort Wilderness Campgrounds. There were fruit and other trees and bushes all around us giving us total privacy. 50 amp hook-up, water, barbeque pit, and bright orange picnic table on our cement parking pad. We were maybe 200 feet from the bus stop where we caught the Disney bus we took throughout the campground to the ferry which took us to the Magic Kingdom. At the bus stop there was a picture of a missing dog named Quincy. Madisyn felt so bad for Quincy and every time we stopped there she’d touch his picture and say Quincy I hope they find you. She has such a sweet loving heart. To get to the ferry we took a short bus ride that dropped us off at the Wilderness restaurants. Outside of Trails End Restaurant they hung several hula hoops and one six occasions Madisyn stopped and practiced her hula hooping skills. The first night we ate at Trails End and Roy enjoyed it so much he said I could just leave him there and come back Thursday to get him. It was a buffet dinner of all great home cooked food, salad bar, dessert bar, potato bar and sweet tea in a mason jar. It always seems like when a restaurant serves you sweet tea in a mason jar that the dinner is always delicious. The price of the meal was way too high but we enjoyed it all the same! We headed back to the bus and on the way there stopped at the playground and at the hula hoop station for Madisyn to have fun. After a good night sleep we woke up at 7:30, ate breakfast at the picnic table while visiting with Squirley who came to visit. He later followed us to Disney and that thrilled Madisyn! We took the ferry which was a fun experience in itself. Madisyn had never ridden on a boat that big and we sat outside on the bow. It’s a beautiful ride to the Magic Kingdom on the ferry. We took it slow once we got off the boat and entered the Magic Kingdom to let Madisyn take it all in. She knew the names of all the characters she saw pictures of as we entered, and couldn’t wait to meet some of them. First stop was to meet Princess Aurora, Rapunzel, Princess Jasmine and Daisy Duck. A stop was necessary at one of the vendors to get her some sparkly Minnie Mouse ears – hot pink of course! Then on to the Mad Tea Cup for a ride and other rides in the morning. We headed back on the ferry to Dora after lunch and took a long nap then headed back to the Magic Kingdom in the afternoon. Madisyn wore her Cinderella dress back to Disney after the nap and was just delightful. Seeing her skipping or running (which she did quite often) in front of us was so precious. Her childish joy and exuberance was contagious making Roy and I almost skip along with her. She’d twirl around in her dress causing those around her to just ooh and aah and of course we the proud grandparents smile, just loving it! Since she had her Cinderella dress on we went back to meet the Princesses and get their autographs. Cinderella was there this time and we got a video of Madisyn meeting her looking just like Cinderella. They sat on the floor visiting and then hugged. It was truly a magical moment for this little girl who thinks that was really Cinderella. We rode Dumbo the Flying Elephant a few times, took some pictures and then headed off on the bus for Hollywood Studios so we could see the Osborne Family Lights and see the snow fall on that street. When we walked around the corner and there it was, Madisyn’s eyes lit up. She could hardly stand it when it started snowing and she kept trying to lick it up with her tongue as it fell. The lights covering every square inch of every building that flashed with the music kept her dancing in the street for quite a while. We took a video of her doing her ballerina dancing in front of one building while an audience watched her. Disney is truly a place where a little girl’s dreams do come true! On we went to Epcot around 8 pm to watch the 9:30 Illuminations firework exhibit. It was cold so we bundled up and found a place to catch the show and just huddled for a while. The show was beautiful as always and Madisyn enjoyed every minute of it except that her fingers were plugged into her ears to keep the loud fireworks noises out. If someone has never seen this firework show, it’s much more than that. It’s a very moving experience about the world coming together in peace. The end of the show features the song “Let there be Peace on Earth”. Everyone joins in and for that moment you do feel that peace on earth could be possible. It’s a beautiful way to feel at Christmas time. After all Jesus is our Peace and wouldn’t it be wonderful if we all feel that way. We didn’t get home until 11 that night and Madisyn was still awake. Within minutes of hitting the bed she was sound asleep and slept until 9 the next morning. It was a little harder getting going on Wednesday our second day there but once we hit the beautiful clear wind on the ferry we woke up and were all looking forward to our day. Madisyn again wore her Cinderella dress and was the center of attention a good bit of the time. There were lots of other little girls with their princess outfits on and they tended to gravitate together and make friends. Anyone who has been to Disney knows the wait is long for the rides. Even though at Christmas the wait is considerably less (maybe 15 for most rides, 40-60 minutes for a couple of rides), the princesses would gather and visit, complimenting each other on their gowns and fixed up hair. Madisyn and Roy were selected to participate in two events together. One was when Madisyn met Belle (who is her favorite) from Beauty and the Beast and Roy was the Knight in the skit. It was one of the new attractions at Fantasyland and was a perfect child oriented event. They also participated in a street skit where a Lady in Waiting and the Gentlemen’s Gentlemen (not sure if that’s what he’s actually called) were teaching the children how to curtsey, and various other important technicalities to palace life! A group of street clowns had a child’s interactive skit she was in, and very much like her daddy was more interested in the bright posters behind her than in the clowns! The star event of the visit was of course “It’s a Small World”. She loved it so much she immediately wanted to ride it again so of course we did that. Actually we did most things twice and some even three times. This was Madisyn’s time at Disney so, within limits, we tried to do what she wanted. We ate a delicious lunch at Pinocchio’s house where we enjoyed a nice rest to the constant go go go. After lunch we made our visit to Belle’s Mansion for the skit there and met Ariel in her Grotto. The carousel was a big hit and it is so beautiful I felt like a princess on it, though I was just the photographer! We flew in the sky with Peter Pan and by that time it was getting dark so we bid farewell to the Magic Kingdom, much to Madisyn’s deep despair. She was very cooperative throughout the trip except for when we were leaving and we fully understood the tears that fell as she walked away, waving bye bye to Mickey. At least we knew we had introduced her t the magical, marvelous world of Disneyworld, the happiest place on earth. After our last ride on the ferry, by 7:30 we were all ready for bed and our last night at Disney with Dora! The morning we were to leave we all slept until 9 am, which means all of us slept at least 12 hours last night. Madisyn and I went out back of Dora and picked some grapefruits from the tree behind us. It was a great place to stay. By 11 we were waving goodbye to our little cement parking spot and heading back to reality. On the way back we ran into about two hours of rain. Roy drove very well through the storm. I feel so much more comfortable with him driving in Dora than in one of our regular vehicles. I learned from our trip going to Disney not to roam around when the RV was moving so I didn’t get queasy!!!!!!! Yeah, big relief – Dora would have been for sale when we got home if that hadn’t stopped! Paw Paw taped several episodes of Dora the Explorer while we were at Disney and we made good use of them keeping the little chatter box occupied on the long ride home. We also enjoyed the movie Cars on this trip. Madisyn is napping on our bed right now so I’m enjoying some blog writing time. We’ll be at Madisyn’s in a couple of hours and will spend the night at Walmart again before heading back to Hammond in the morning. It’s been a wonderful trip and we are both so thankful to have been able to have this experience with our granddaughter Madisyn. We’ve been to Disney several times over the years and this one was like going the first time. Everything was new for her and we got to experience that. She’s only 3, almost 4, so she may not remember all the details of our trip but we believe we’ve created some lasting memories for her of how very much her grandparents love her and how special she is to us! My next blog will be a bunch of pictures from our trip – please check them out! After hearing our Trinity Baptist Church Adult Choir present their Christmas Cantata “All is Well”, we came back home and prepared to set out for Disneyworld. It never feels like Christmas until we hear the choir sing their Christmas cantata. It’s always such a wonderful reminder that Christmas is not about all the commercial things it’s made into by society. It’s first and foremost about the birth of our Lord and Savior Jesus Christ. He left his heavenly home and came down to earth as a tiny infant with the sole intention of sacrificially giving his own life to save us from our sins. That is so much bigger and more wonderful than any green and red decoration or present we find under the tree. Our choir is made up of regular every day people who sing because they love the Lord and the message they always bring to us blesses my heart so much. Madisyn and her Christmas buddies. This has been an absolutely magical trip. Seeing Disney through the eyes of a 3 year old made this the best trip ever. We picked Madisyn up Sunday evening and got to Ft. Wilderness at Disneyworld Monday evening. Dora made the trip just fine and Roy was a master RV driver navigating our way through Ft. Wilderness Campground in the dark. 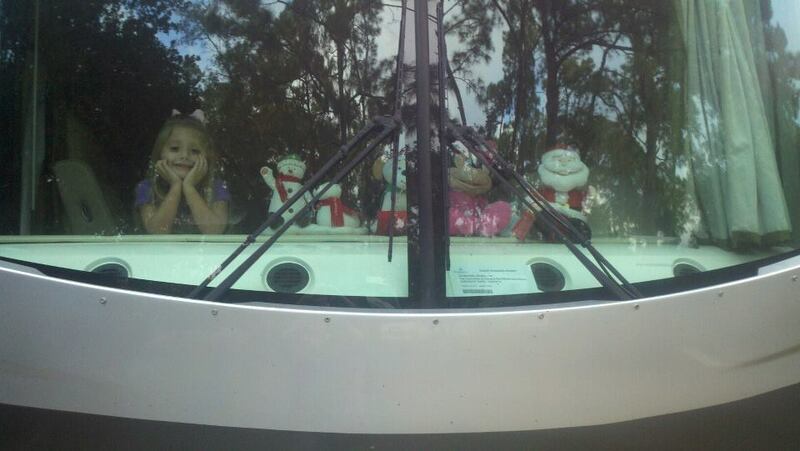 Madisyn lined up all of her stuffed Christmas buddies in the RV window and posed for a photo with them our first morning there. She’s been a joy to have with us and I’m so thankful we got to share this experience with her. She’s been dressed in her Cinderella dress most of the time we’ve been here. Everyone has been so taken with her little cinderella self and she’s made friends with all the little children she met. We’re headed home in the morning but wanted to post a brief blog about our trip and our wonderful granddaughter. It’s only 7:30 and I think we’re all headed for bed! Goodnight! 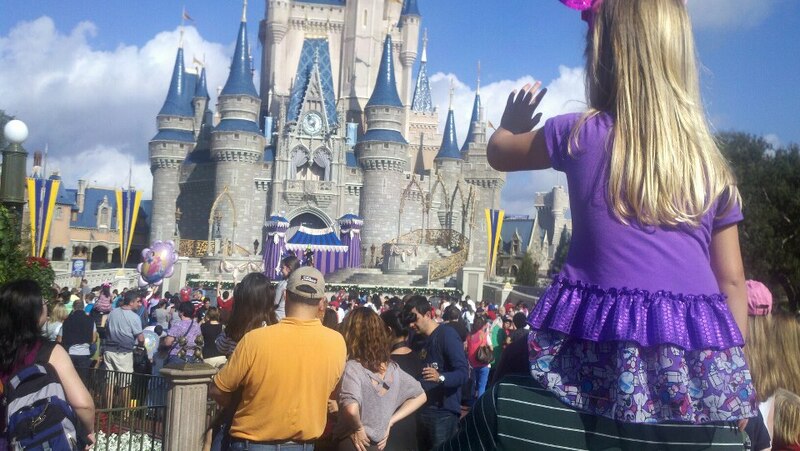 Madisyn on Paw Paw’s shoulders watching the show at the Enchanted Castle! We thought going into this that finding places for our things we wanted to take would be horribly difficult. We’ve found that finding places for our stuff has been an evolving event. When we first started moving in we went through each room in the sticks house and took what we thought we’d need, including our clothes. Surprisingly, at least 75% of what we brought to the RV was kept out there. Each weekend when I have time to think and plan, I spend some time reevaluating what we’re keeping based on the past week’s experiences and where it’s being kept. As of today Dec 10th we have been in the RV one month and have about 20% of the storage space below the RV filled so I’m feeling really confident that we’re on target to have room to bring everything we really want to with us. It still amazes me how much not really needed “stuff” we’ve accumulated in 40 years of marriage. As I went through the house I tried to look at each thing and decide which of three categories that thing would go into. The categories were “trash”, “garage sale” and “keep in the RV”. This process started in August and now in December we are not finished yet. I spent at least 50% of my free time in August and September on this filtering process. October, November and December have found every weekend dedicated to the filtering. In between the filtering was pricing for garage sales, showing furniture and furnishings to people interested in buying them and cleaning each room and researching every aspect of RVing we could. We just do not rest any longer, but we’re loving it! Each person that has come into our lives in this selling spree has brought something special to this experience. There is something about someone coming into your home to buy your things, especially the ones that mean a lot to you, that really attaches you to the person. Got a much needed 11 hours of sleep one weekend! Enjoyed the quiet morning in the RV once again rearranging things in the cabinets. I’ll get it right before long I hope! I made my way to the stick house to hopefully finish up emptying the first floor. Roy’s entire day was spent working on installing Roadmaster Invisibrakes on our toad. I pulled out the remaining Christmas decorations and our small tree from under the stairs. We purchased a smaller 4’ tree last year to go on top of one of the end tables. The tables are all sold so the tree is standing on the floor! The few decorations we kept were used to decorate the tree. It looks odd in the empty living room but our granddaughter will be here with her daddy for Christmas and she just wouldn’t understand Grannie and Paw Paw not having a tree. Used the last of our Christmas wrapping to wrap the kids presents. There’s been a lot of using up last things recently. A lady came to see the dining room table and chairs. She and her husband are looking at our set and another set. We’re in a competition! She liked it and I enjoyed visiting with her. 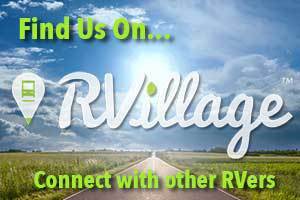 People are always intrigued when we tell them we’re selling everything and bought the RV to travel. Her husband may come by later to see the set also. Cleared off remaining items from the shelves over the washer/dryer and brought two boxes of garage sale things out to the garage. The washer/dryer are being picked up next week so I put them through a good workout today for possibly the last time. Sold them a while back and kept them as long as we could, but they are needed in their new home so we must let them go! A co-worker and her daughter and granddaughter came over to see the girls bedroom set. I’m hoping the set goes to a good home and would love for little Chloe to have it waiting for her when she gets big enough to use it. Cooked a nice dinner in the RV. The two burner cooker is coming in very handy and I’m loving the ease and quickness with which the convection oven cooks. Roy’s finally starting to feel comfortable that he’ll not starve in the RV. Thought we were going to enjoy the evening resting when I got a call from the husband of the lady who saw the dining room set and he wanted to come see it. All of our furniture would be sold if he buys the dining room set and my friend buys the girls bedroom set. I’d love being able to be at that point. I want to be totally prepared to make a fast exit when someone buys the house! Time to crash and call it a night! After church that weekend I went to Lowe’s to buy pansies for the gardens. Everything is starting to look very wintery, not dead but not blooming. I bought seven trays of pansies and spent three hours planting them in the flower gardens. They did the trick, made everything look a little more alive. I just know this will make a difference in selling the house! Didn’t hear from the couple about our dining table. Maybe tomorrow. Watched our beloved Saints lose another game today. They’re still our guys but I sure wish they’d play like we know they can. Back to work tomorrow, last week of work before the Christmas two weeks off work. My coworker says she does want to buy the girls bedroom set so we’re left with just two dining room pieces! Someone came to see the buffet server today, he’s buying it for a friend for Christmas. We are heading out to Disneyworld with our granddaughter Madisyn on Sunday the 17th. This will be our true first adventure on the road. A 12 hour driving trip is a good test. I have such confidence in Roy’s RV driving ability already. He’s done very well each time we’ve gone out, all except for dipping into our ditch when returning home!!!!!!!!!!!!!! The last time out was just a tiny, tiny dip so he’s improving on that. We’ll blog about our Disney adventure and try to post some pictures. I hope to add pictures to past posts in my blog as I get time and more knowledge about this blogging process. I wanted to get my thoughts down first and then move on to the pretty stuff! ONE DAY CLOSER TO OUR DREAM!!!! !